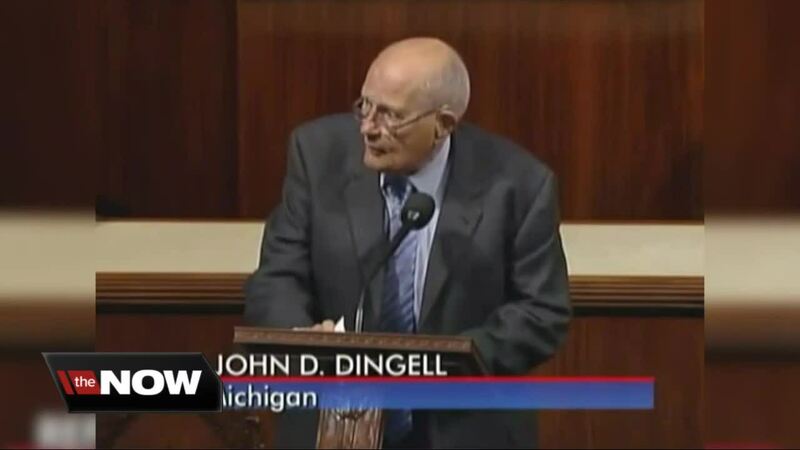 John Dingell lead with such dignity here in DC – so his colleagues in the House and the Senate want to give him a very fitting farewell tomorrow. Michigan has said goodbye to the former Congressman. Now it’s Washington’s turn. WASHINGTON DC (WXYZ) — John Dingell lead with such dignity here in DC – so his colleagues in the House and the Senate want to give him a very fitting farewell tomorrow. Michigan has said goodbye to the former Congressman. Now it’s Washington’s turn. "In the quiet times is when it got hard," says Senator Debbie Stabenow. "So I was glad to be there." After the legendary legislator’s funeral in Dearborn on Tuesday, Stabenow was on the Honor Flight that brought the Dingell family and the congressman’s casket back to Washington DC. "I was thinking as we were driving in the motorcade to the airport that I have had hundreds and hundreds of flights, where I’ve gotten on the flight, said hello to John, we were both going in to DC for the week, and both coming home on the weekend," Stabenow says. "And this was his last flight to DC." Stabenow served with Dingell in Washington for nearly 2 decades. From the Civil Rights Act – to the Affordable Care Act – Stabenow says the Dean of Congress was always there to reach across the aisle and get the work of the people done. "He showed how you can stand up and fight for what you believe in and still make a compromise in order to make progress happen," Stabenow says. Tonight on the House Floor at the capitol, the Michigan Delegation held Special Order speeches – where members came and shared their stories about Mr. Dingell. So as you can see, the tributes continue here in in the capitol.